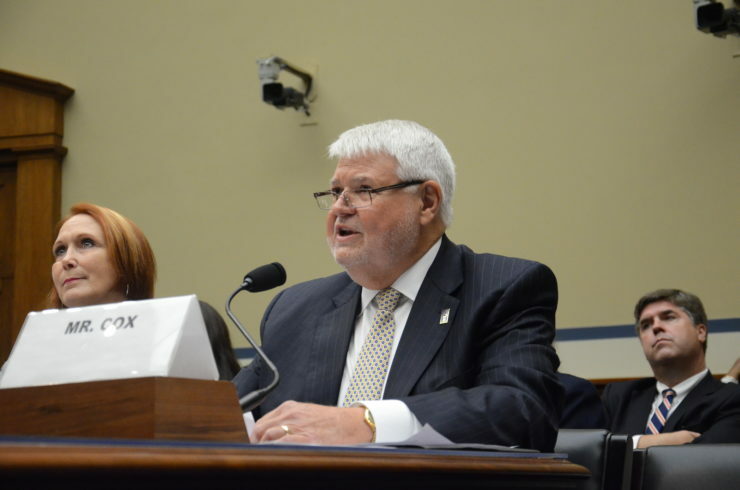 J. David Cox, president of the American Federation of Government Employees, testifies before a House Committee on Oversight and Government Reform subcommittee. Consumer groups, veterans advocates, ethics experts and union leaders continued to blast the Department of Veterans Affairs today for its plan to unilaterally scrap a 50-year-old anti-corruption statute, even though VA officials already promised to withdraw the effort. “We couldn’t just rely on informal assurances offered to the media,” said Walter Shaub, the former director of the Office of Government Ethics, who resigned in protest in July. The proposed change, exposed by Reveal from The Center for Investigative Reporting, was set to go into effect Monday. It would have allowed VA employees to receive “wages, salary, dividends, gratuities” and services from for-profit schools that receive GI Bill funds. VA employees also would be allowed to have an ownership interest in such schools. The VA had said other criminal laws would prevent those employees from making decisions that could benefit for-profit colleges. Veteran and consumer groups responded that those laws were narrowly crafted and filled with loopholes. On Wednesday, after five U.S. senators and a long list of veterans groups registered their opposition, the VA said it was pulling the measure. But as of this afternoon, it still appeared on the Federal Register. VA press secretary Curt Cashour told Reveal that the agency would formally pull the rule Monday, the day the change was set to take effect. He sent a link to a withdrawal notice that had not yet been published, set to be effective Monday. “The VA received a significant number of comments and has determined not to pursue implementation of the waiver as originally proposed,” it reads. Meanwhile, opponents of the change continued to register their displeasure. Many were worried that the agency might return with a revised waiver to allow more limited financial relationships – such as permitting for-profit colleges to offer free classes to VA workers. A coalition of consumer advocates, including the Consumer Federation of America and the National Consumer Law Center, noted that existing law already gives the secretary of veterans affairs the authority to waive the law on a case-by-case basis. The consumer groups noted that similar ethics safeguards are present throughout the federal government. Federal Aviation Administration employees are barred from owning stock in airlines, they said, and workers at the Food and Drug Administration are barred from owning shares in companies that agency regulates.